VSAT 2016 Application Form: Vignan University Guntur is going to release the VSAT Online Application From 2016 for the admission of the UG programmes such as B.Tech in engineering and Bachelor of computer application (BCA). So the applicants are advised to keep visiting our website regularly for latest information regarding the Vignan University guntur b.tech admission 2016. Once the University announced any notification about the VSAT Application Form 2016, we will update in our indiagrade.com website. You will get instant updates regarding the Vignan University b.tech admission 2016, like our Facebook page. 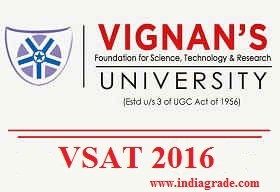 The university has been conducting the Vignan Scholastic Aptitude Test (VSAT) every year. The following streams are available in the UG level, thet are Agricultural, Biotechnology, Chemical, Electronics & Communications Engg (ECE), Computer science & Engineering (CSE), Electrical & Electronics Engineering (EEE), Food Technology, BBA + MBA Integrated Course, Bio medical, Automobile, Bioinformatics, Civil, Information Technology (IT), Mechatronics, Mechanical, Textile Technology, B.Tech + MBA, Petroleum Engineering and BCA. Candidates are advised to complete the VSAT 2016 Registration before the last date of the submission of the application form. They are encouraged to read the official notification carefully before going to apply for the VSAT 2016 Entrance Examination. Applications received after the last date will be rejected. 4. Application Fee: Rs.1000/- (Demand Draft should be drawn in favour of Vignan University payable at Guntur). You can get the application form from the Vignan University Guntur and Vignan Schools at Guntur, Visakhapatnam, Hyderabad, Rajahmudry and Eluru. Candidates can also get the application form from the Head Post Office of Andhra Pradesh & Telangana. By Online Mode: You can download the application form from the online website of Vignan University. You can get the application form by any of the modes mentioned above. Then fill all the details in the registration form without any error. You should create a check list for the required documents. Attach all the relevant documents with the application form. Send the filled VSAT 2016 application form to the address given below.